Retirees may want to pick up shares of Illinois Tool Works, Pfizer, and Target. Here's why. Dividend stocks can be a vital source of passive income for retirees. Nonetheless, stocks aren't exactly risk-free investing vehicles, especially in this turbulent market. So to help guide investors through this particularly choppy market, our team of Foolish dividend experts offer three stock picks that should perform admirably in any type of market. Andres Cardenal: Investors in retirement typically gravitate toward solid and reliable companies with a proven track record of consistent dividend growth over the long term, and Target (NYSE:TGT) fits that description quite well. The company paid its first dividend in 1967, and it has rewarded shareholders with uninterrupted dividend payments every year since. Even better, Target has increased its dividends for 45 consecutive years. What was a quarterly dividend of $0.30 per share in 2012 has now doubled to $0.60 quarterly, so dividend growth has been quite vigorous over the past several years. After announcing a 7.1% dividend increase in June, Target is offering investors a 3.4% yield at current prices. The dividend payout ratio is conservatively low, in the area of 47% versus earnings expectations for the current fiscal year, so the company has plenty of room to continue raising dividends in the future. Target is enjoying attractive sales growth in the important online channel. E-commerce sales grew 23% last quarter. Moreover, profit margins are increasing on the back of cost disciplines and growing revenues from the company's signature categories. This trend allowed Target to deliver a healthy 16.5% increase in adjusted earnings per share during the first quarter of 2016. Neha Chamaria: For a steady dividend income stream, it's important to look beyond simple dividend yields and choose a dividend-paying company that's growing its earnings and cash flows at a rate good enough to cover future potential dividend increases. Keeping that in mind, Illinois Tool Works (NYSE:ITW) looks like a great choice for retirees. At a time when global concerns have hurt margins at most industrial companies, Illinois Tool Works' operating margin hit a record quarterly high of 22.1% during the first quarter, thanks largely to aggressive cost control. 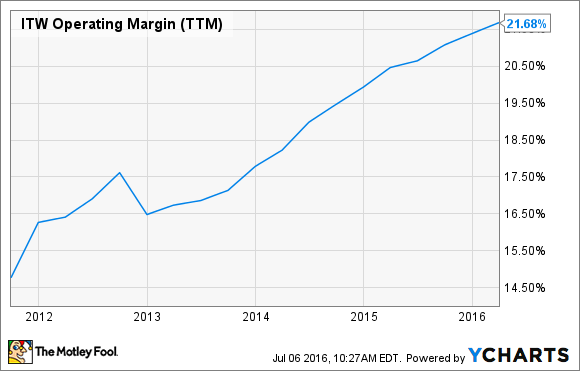 In fact, its margin has grown dramatically in five years and continues to rise. Illinois Tool Works expects its earnings per share to grow 7% at the midpoint this year. Better yet, it is targeting an EPS growth of 10%-12% beyond 2017. As earnings grow, so should dividends. Of course, these are only projections and may fall short. Now here's where Illinois Tool Works scores a brownie point: Even if its earnings were to decelerate, or even stall in the worst-case scenario, the company should still be able to increase its dividend every year, as it has for the past 52 years, simply because it's currently paying out less than 40% of its net income and free cash flows in dividends. However, considering Illinois Tool Works' diverse product portfolio that serves industries ranging from oil and gas to aerospace, food, automotive, construction, and electronics, to name a few, there's little chance its earnings will stop growing altogether. If that's encouraging, it's also commendable that the company's free cash flow exceeded its net income last year -- definitely a green flag for dividend investors. George Budwell: For investors looking for a sizable dividend yield that's sustainable for the long haul, I think the Big Pharma stock Pfizer (NYSE:PFE) should be at the top of your list. Pfizer's noteworthy 3.3% yield is worth checking out because the drugmaker sports a liquid cash position of nearly $20 billion, generates free cash flows north of $15 billion, and has a reasonable debt-to-equity ratio of 62% -- well below the average among major drug manufacturers of 86%. While its 12-month trailing payout ratio of 93% is a tad concerning, the drugmaker's top line is starting to recover as a result of strong product launches for the breast-cancer drug Ibrance and the blood thinner Eliquis. Specifically, the Street has Pfizer's top line rising by a healthy 7.3% this year, and another 4% next year. And with several potential blockbuster products such as the immune checkpoint inhibitor avelumab making steady progress in the clinic, Pfizer's payout ratio should drop markedly going forward -- that is, unless the drugmaker continues to raise its dividend. All told, Pfizer's dividend should be a reliable and relatively worry-free source of passive income for retirees for a long time to come.